The NFL wants to conquer the screens that dominate 21st-century culture: computers, tablets, and mobile phones. After years of fumbling its digital presentation, the league is finally embracing live streaming as part of a “tri-cast” distribution model of broadcast, cable, and internet. Thanks to these developments, there are now more ways than ever to get your gridiron on when the season gets underway on Thursday, September 6, with a matchup between the Super Bowl LII Champion Philadelphia Eagles and the Atlanta Falcons. Here’s our guide to all your options. Unlike the NBA, NHL, or MLB, the NFL plays a simple 16-game schedule with each team playing one game per week. That lends itself to fairly predictable TV programming. The league splits the Sunday afternoon telecasts by conference: AFC games air on CBS and Fox runs the NFC games. During the first 16 weeks of the season, each network airs eight doubleheaders but not necessarily on alternate weeks. Early games start at 1 p.m. ET; late games start at 4:05 p.m. ET for the network carrying the singleheader and 4:25 p.m. ET for the one airing the doubleheader. NBC retains the popular Sunday Night Football broadcast, which kicks off at 8:20 p.m. ET. All you’ll need is an over-the-air digital TV antenna and reasonable proximity to a broadcast tower. You’ll find our top antenna picks here. 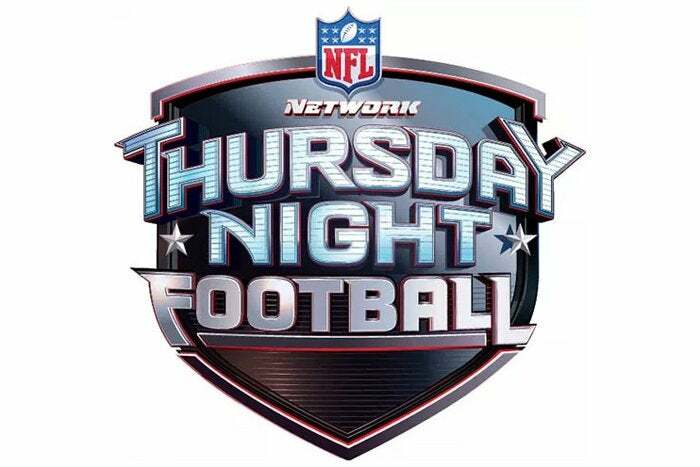 This year, 11 of 18 Thursday Night Football broadcasts will be broadcast on Fox and simulcast on the cable-only NFL Network. The league’s flagship channel retains sole ownership of the remaining seven games, which includes a Week 8 International Series matchup from London between the Eagles and Jacksonville Jaguars. Fox will broadcast 11 of 18 Thursday night games this year. That leaves out only the iconic Monday Night Football game on cable-only ESPN, to which you can get access via one of the streaming options below. If this abundance of TV offerings has your head swimming like you just took a bone-crushing hit from J.J. Watt, check out 506Sports.com or Sports Media Watch. Each site lists which game is on what channel for each week of the season. Bookmark them for easy access. Even if you don’t have a cable subscription or a TV antenna, you still have plenty of options for catching all the pro pigskin action. Streaming options continue to expand each season, offering plenty of ways to tailor your viewing. But while we highlight what each service offers, the availability of individual channels’ live content can vary by market. It pays to check via each service’s website what it offers in your area before subscribing. DirectTV Now, DirectTV’s streaming service, offers every channel broadcasting NFL games this year, including NFL Network. You’ll need the $55-a-month Just Right package to get all of them. Games can be viewed via the web or on iOS and Android devices, Google Chromecast, Xbox 360, and Roku and Sony PlayStation consoles. 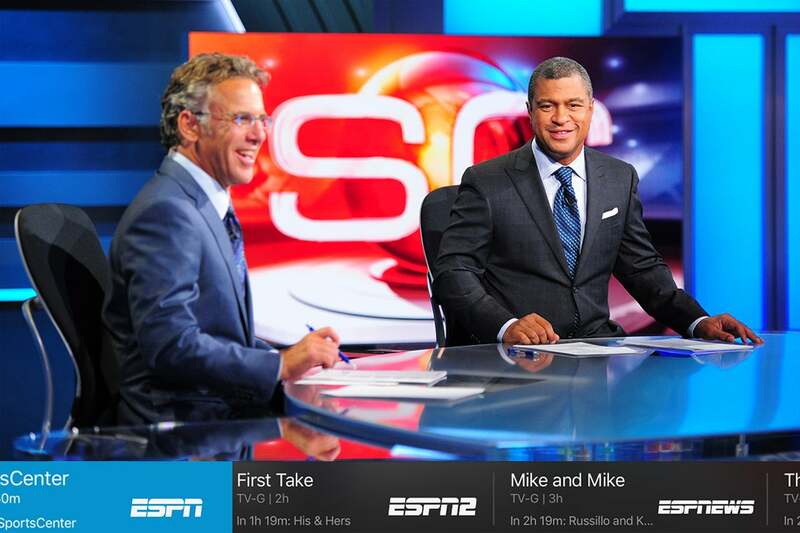 Sling TV splits ESPN and NFL Network into separate channel bundles. You’ll need Sling Orange to get the former and Sling Blue to get the latter. CBS will continue to stream its NFL telecasts to subscribers of its $6-per-month CBS All Access service (its recently expanded deal with the NFL also grants CBS rights to stream the games on mobile devices, but they will only be available to cable subscribers). And Amazon will stream through Amazon Prime Video all the Thursday Night Football games broadcast on Fox. If you don’t want to shell out the $119 annual Amazon Prime membership fee to get access to Amazon Prime Video, you can still catch those games as they’ll be streamed live for free on Amazon-owned Twitch. Both Hulu with Live TV and YouTube TV will give you all the season’s Sunday games and Monday Night Football—but not NFL Network—for a $40 monthly subscription. FuboTV will give you CBS, FOX, and NBC for all Sunday’s games plus NFL Network for Thursday’s in its basic package, which costs $40 for the introductory month, and $45 per month after that. For an additional $9 per month, you can also get NFL RedZone via the service’s Sports Plus add-on. Hosted by Scott Hanson and existing only for about a seven-hour window each Sunday, RedZone airs nothing but the day’s highlights (mostly touchdowns, as the name suggests) at a frenetic pace that perfectly evokes the adrenaline rush of a game-winning drive. Sling TV’s live NFL offerings are divided between their two channel packages: Sling Orange includes ESPN and Sling Blue has FOX and NBC. The monthly fee for each package is $25, but you can all three channels for just $40 per month by purchasing the Sling Orange + Sling Blue value package. For an additional $10 per month, you can also get NFL RedZone. To get all Sunday’s AFC games, though, you’ll still need to purchase a CBS All Access subscription as Sling TV doesn’t offer that network. NFL Network is included in the PlayStation Vue Core and Elite packages; you can get an entire season of NFL RedZone for an additional $40. 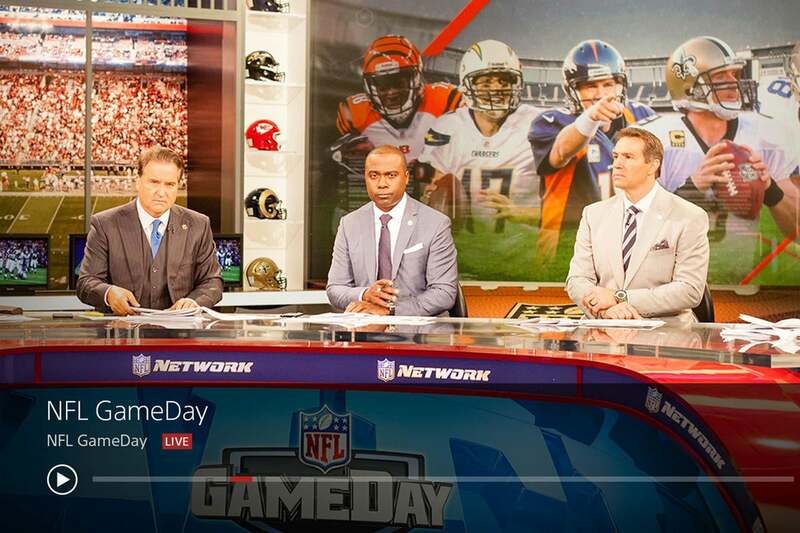 Sony’s PlayStation Vue service offers CBS, Fox, NBC, ESPN, NFL Network and NFL Redzone in its channel lineup. You can get the five networks in its $50-per-month Core subscription, and add NFL RedZone with the addition of the Sports Pack for $10 per month. In previous years, Verizon subscribers with a More Everything plan could live stream all nationally broadcast games through the NFL Mobile app. This season, anyone—regardless of carrier—can live-stream games, but with a few significant caveats: You’ll only be able to watch your in-market games and the national Thursday-, Sunday-, and Monday-night broadcasts. And can view them only on your phone. The games will also be streamed on the Verizon-owned Yahoo and Yahoo Sports apps. NFL Game Pass lets you watch all out-of-market pre-season games live, and you can replay every regular-season game after its conclusion. If you can live without seeing the action, you can opt for live localized radio broadcasts from wherever you have broadband access. NFL Game Pass also gives you a couple of unique ways of watching concluded games: You can see a condensed view of the game, which summarizes all the action into about 45 minutes, or you can view Coaches Film, which shows the game from your choice of two camera angles: The All 22 and the High End Zone. The All 22 camera is positioned high above the field to capture all 22 players at once. The High End Zone camera is positioned on either side of a field, high above the goal posts and behind the end zone. This camera angle shows what the play looks like as game action is happening coming toward (or going away from) the end-zone camera. 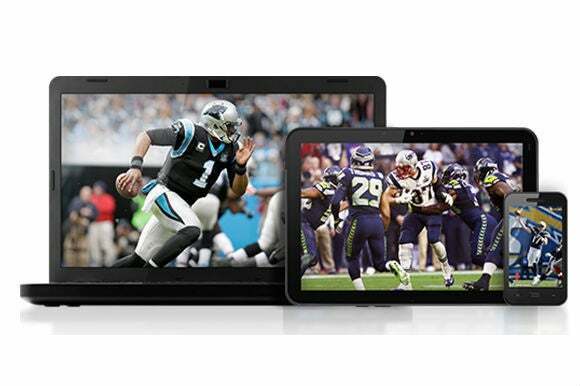 NFL Game Pass lets you watch all the regular-season games for a one-time fee of $99. But you won’t be able to watch them live. 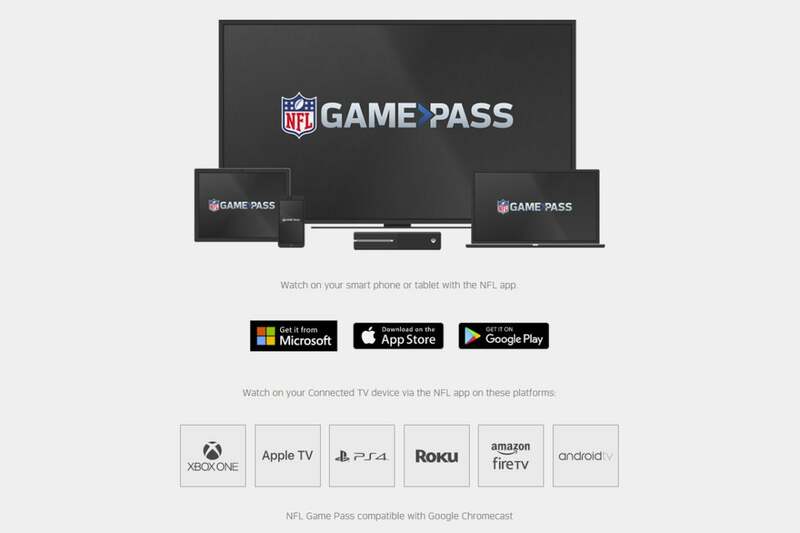 NFL Game Pass costs $99 for the season (regardless of when you sign up during the 2018/2019 season, your subscription will expire on July 31, 2019). The app is available on a broad array of devices, including smart TVs and Windows PCs; the Xbox One and PS4 gaming consoles; Android TV, Amazon Fire TV, Apple TV, and Roku streaming boxes; and mobile devices running Android and iOS. Super Bowl LII broke previous streaming records for the NFL championship game, with an average streaming audience of 2.2 million. While that represents just a tiny fraction of all Super Bowl viewing, it shows that there is an audience willing to embrace alternatives. And if the NFL continues to make a serious commitment to live streaming, perhaps it will set new bar for broadcasting sports in the 21st century just as it did in the 20th. Looking for even more ways to watch the game this season? Don’t miss our roundup of second-screen apps. Correction: This story was updated to report the correct rotation of NFL double-header broadcasts.